Caveats: The formulas were calibrated to known player counts in the St. Paul, MN area, so these results assume that the Chicago market has as many players per 1000 of population as the St. Paul, MN area, and Chicago area players are as willing to travel far to play. The actual demand for a disc golf course can vary widely from these figures, and depends on the efforts to host events, keep the course in good shape, as well as the quality of the design. The percentage of players who will pay a given fee was calculated based on a nationwide survey by the Professional Disc Golf Association. It may not represent the willingness of Chicago area players to pay fees. Results: A free 9-hole course would be busy, and an 18-hole course would be jammed. About 3 times as many players will want to play an 18-hole course as a 9-hole course, but the course couldn't handle all of them. A 9-hole course would have about 600 players per week in the summer. A pay to play 18-hole course would need to charge $6.50 to drive away enough people to keep the crowds down to 1600 per week - about the maximum a course can serve. The $6.50 fee will drive away about half of potential players, based on my interpretation of the recent PDGA survey. That would generate over $10,000 per week in revenue, during the summer. For a 9-hole course, there isn't any data about the willingness to pay a fee. It may be that very few players would be willing to pay anything. An optimistic guess is that people are willing to pay half as much to play 9 holes as they are to play 18. If so, revenue would be optimized at a $2.50 fee which would drive away 25% of potential players and get about $1,800 in revenue per week. If the numbers are optimistic by a factor of 3 (which is entirely possible), then the 18-hole course would optimize revenue by charging $5 for an 18-hole course and it could expect about 800 players per week for about $4,000 revenue. Or a 9-hole course might be able to charge $2.50 and get about 250 players and $600 per week. All of this is for peak weeks in the summer, after a few years of being up and running and offering tournaments and leagues. That ratio if the number of players at an 18-hole course as at a 9-hole course. (about 3 times as many) is lower than in other parts of the country. Usually an 18-hole course can draw up to 10 times the number of players as a 9-hole course. 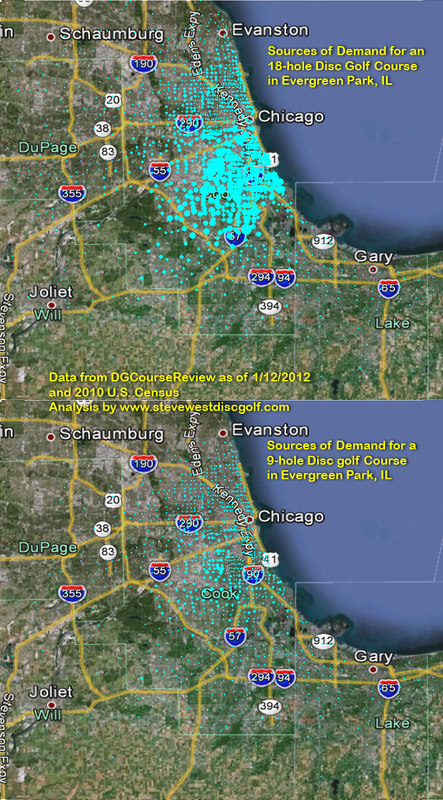 The explanation is that a disproportionate share of the competing courses in the Chicago area are 9-hole courses. Also interesting is that a 9-hole course will draw a more diffuse crowd from a spread-out area, whereas the 18-hole course will become a dominate course in the local area. The maps below show where 90% of the players will come from. The other 10% will be occasional visitors from farther away places. Each circle represents a 2010 U.S. Census tract, with the area of the circle proportionate to the number of players visiting from that location.